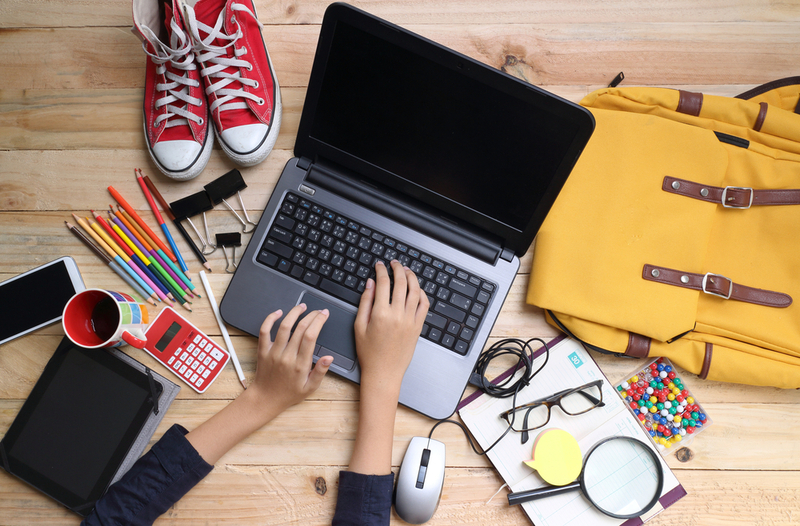 While every student is different, they all need desks that are comfortable to spend long hours working at with plenty of storage for books, desk supplies, and more. There are so many desks on the market today, and the sheer amount of choices can be overwhelming. Never fear! We’ve researched to find the best student desks. Let’s dive in and learn more about to choose the best one and the desks that made our list. 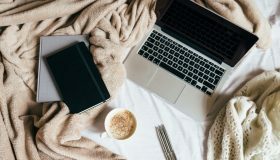 Students often have the problem of a lack of space as they squeeze all of their belongings into small bedrooms or college dorm rooms. Some students simply work on the dining room table or their bed. However, students without desks lack a space conducive to studying and learning. Those who utilize desks often find that they can focus and concentrate better. While every student is different, certain features make up the best desk for students. Here are a few of the most important features to look for. The best student desks have excellent functionality as well as style. Today’s furniture designers create student desks in a variety of styles and designs. There are multipurpose desks, desks geared towards kids, adults, girls, and boys as well as those explicitly advertised as computer desks. Functionality is different for each person and their requirements which is why there are so many choices on the market. 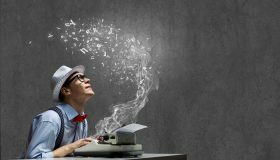 Do you need a small desk, one to read and write on a computer desk, or one that serves many purposes? 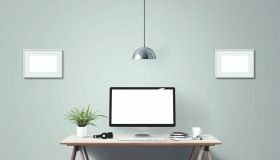 These are some of the questions you need to ask yourself when you’re looking for the perfect desk. Storage is a necessity for everyone but more so for students who have large amounts of educational materials, books, papers, notebooks, and more. The best student desks have shelves and drawers for office supplies and class materials. Some come with a built-in filing cabinet, and others have simple open storage shelves. 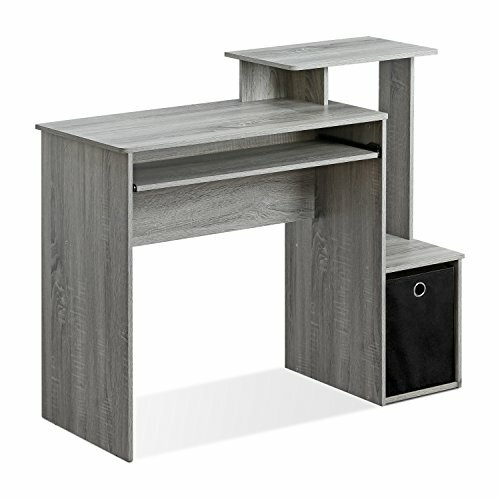 If you have enough space, you can pair a great student desk with a bookcase or hutch for even more storage. You can virtually find almost any storage feature that you desire or create your own unique system. Let’s face it; assembly is probably the worst part of buying furniture. Most students don’t have time to waste hours putting a desk together. Often the simpler the desk, the simpler the assembly process. You can pay someone to put your desk together for you, but if you’re like most students, you don’t have the extra cash. Unfortunately, assembly plays a vital role in the stability of your furniture. So, if you don’t have confidence in your desk-building skills get a savvy friend to help. Otherwise, you may have to pay a professional to put it together. You don’t want your desk to break because you didn’t assemble it correctly. Composite wood is still one of the most popular materials to make furniture from. Steel is another common material in many desks, and it makes them durable and sturdy. Some desks also have tempered glass or other materials in them. A solid wooden desk or steel one will last a long time. Some people advise students to buy desks made from laminate wood instead of solid wood because it’s more durable and cleans easier. The ideal height for a desk is between 26-30 inches. Of course, the proper height for everyone is different. You must be able to sit at the table comfortably with no posture problems. If your desk isn’t comfortable, you’ll end up working somewhere else, and your desk will gather dust. The desk you choose must fit you and feel comfortable when your sitting for long periods. You also don’t want sharp corners or rough edges. You’ll constantly scrape your arms and elbows. Remember to purchase a comfortable chair for your desk. One designed ergonomically is best for comfort and functionality. Furthermore, a poorly designed table will cause ergonomic concerns. Do you plan on moving your desk around a lot? Are you someone that rearranges furniture regularly. If so, then a large solid desk probably isn’t your best choice. Consider picking a desk that has wheels, so it’s easy to move. Most people need a desk that serves many purposes. A multifunctional table is great for studying, research, craft projects, and more. When you can use one surface for all your needs, you’ll save money and likely work better and smarter. Your storage should be versatile as well. Let’s take a look at our top 5 picks. Two drawers with patented T-lock assembly system feature metal runners and safety stops. 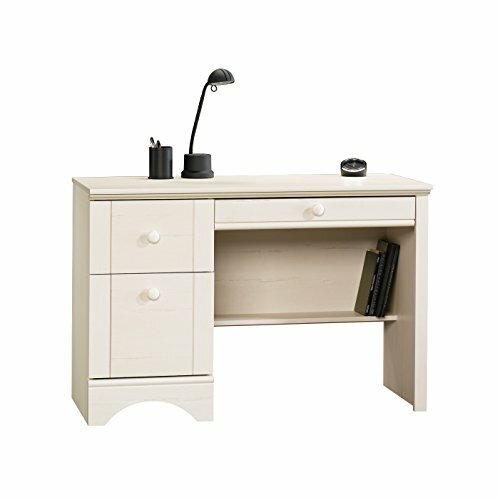 This desk is one of the most expensive on our list, but it’s still economical and very popular. It comes in three finishes, antiqued paint, salt oak, or antiqued white. One nice thing about this choice is that for an extra fee you can have an expert assemble it for you. The largest drawer has safety stops and metal runners with a flip-down panel perfect for your keyboard and mouse. Two additional drawers on the left side also have safety stops and metal runners as well as a patented and unique T-lock assembly system that saves you time if you choose to put the desk together yourself. The lower and deepest drawer is for hanging files that accommodate letter-sized paper. Dimensions for this desk are 43.47 x 19.45 x 28.98 inches. For a desk with ample storage, it occupies a small area, and you can place it in just about any room. Pair it with a comfortable desk chair, and you have a fabulous study station. 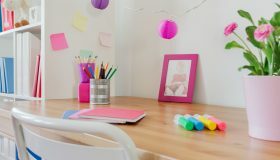 This desk looks like it belongs in a quaint cottage and its simple design fits in with the furniture you already have. It’s sturdy, and some customers were surprised at the quality it offered for the price they paid. This OneSpace desk takes up minimal space and comes very economically priced. 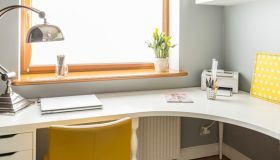 While it doesn’t have as much storage as some of the other desks on our lists, its significant value is that it’s great for really small spaces. It also comes in several finishes including cherry red, espresso, black, white oak, and maple, so there is a color to match your current furniture. For additional money, you can have an expert set this desk up for you or put it together yourself. It has an elegant and sleek design with a pullout shelf perfect for your keyboard and mouse. This desk also has a bottom shelf for more storage. It consists of PVC, MDF, and steel for durability. This desk is lightweight but can hold up to 100 lbs. of equipment and electronics. It’s the perfect choice for a kid’s room or any area serving more than one purpose. The dimensions for the desk are 19.6 x 27.5 x 29.5 inches. It’s comfortable to use. The OneSpace desk is easy to assemble and doesn’t take hours to put together. It came with everything necessary to assemble it. The materials used to make this desk are also in compliance with CARB phase 2. CARB stands for the California Air Resources Board and refers to the state’s program to reduce the number of harmful air pollutants that we expose ourselves to. This sturdy little desk has a simple modern design and comes in pure black, white, royal cherry, or chocolate. You can choose the option to have drawers or a larger door on the right side. It’s sure to go well with the other furniture in your home. The South Shore desk is excellent for someone working from home or students and has places to store your notebooks, books, and other office supplies no matter which model you choose. There is plenty of workspace to use your computer or read and write. The drawers have metal slides and handles, and there is a hole in the back of the desk to run cords and wires for all of your electronics through. 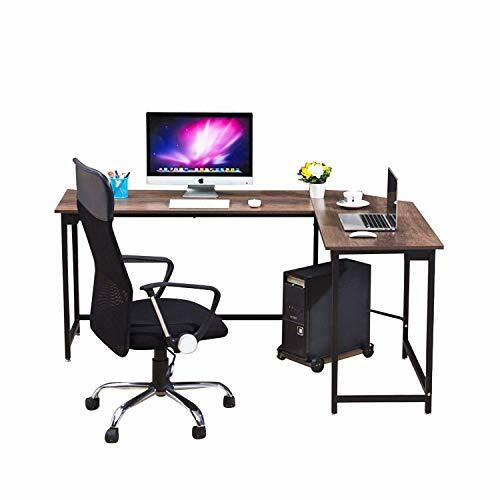 This desk was made in North America from eco-friendly particle board and meets or exceeds all safety standards in the United States. Caring for this desk is easy, just wipe it clean with a dry cloth. What’s unique about this product is the 5-year limited warranty. South Shore stands behind its products. They also have an in-house testing facility to make sure the packaging that they ship this desk in protects it from damage. The company suggests that you have help putting the desk together if you choose to assemble it yourself. Also, the tools needed don’t come with the desk. Another great South Shore desk, this one is a little less expensive than the option above, and it comes in pure white, chocolate, black, royal cherry, and natural maple. 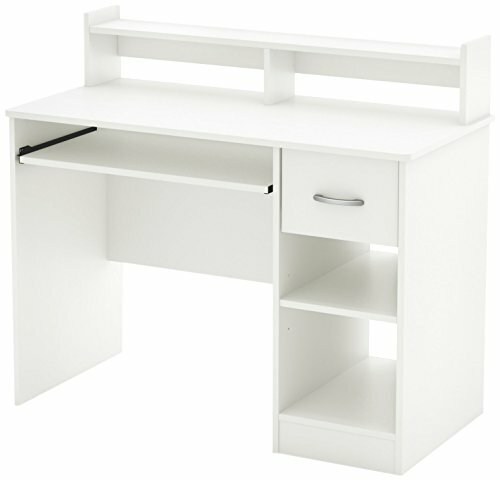 This desk has two open storage areas and one adjustable shelf that can accommodate up to 15 lbs. It also contains one traditional drawer, so there is plenty of room to store your supplies and equipment. South Shore crafted this desk from eco-friendly particle board in North America as well. It has a 5-year limited warranty. It’s easy to put together or you can pay an extra fee for an expert to assemble it. The instructions are easy to follow. Designed to be compact, it fits in almost any space. There is ample work surface for a computer or to work on homework. A cutout in the back panel allows you to pass cords and wires through for easy management. South Shore offers customer support 7-days a week, so they are easy to contact for assistance. Students advised that it withstood the weight of many textbooks during finals weeks and is an excellent addition to any room. 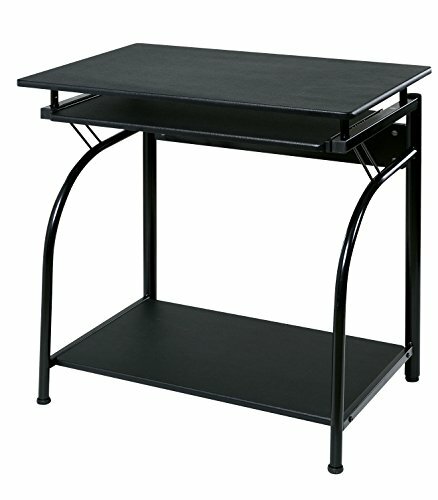 This inexpensive desk option offers multiple levels for all of your computer hardware and equipment. This desk comes in various finishes to match your décor such as black and brown, Columbia walnut and dark brown, French Oak grey, light cherry and black, and white and black. You can also choose to assemble it yourself or have an expert put it together. Another desk that’s simple in style and made from composite wood and non-woven bins that are CARB compliant. Its dimensions are 39.4 x 15.75. x 34.1 inches so it’s small and fits in almost any space. 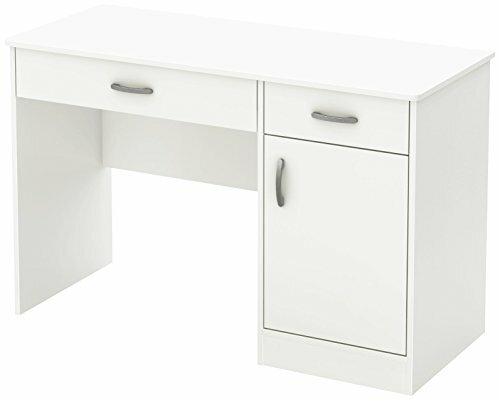 With features such as a slide-out drawer for your keyboard, a non-woven drawer, and CPU storage this desk is an excellent choice for students. Add a small bookcase and nice desk chair, and you’re ready for hours of study in your own little office area. Furinno was founded in the United States in 2010 by some young entrepreneurs as a joint venture business with an established company in Malaysia. They are one of the largest Ready-to-Assemble (RTA) manufacturers in the world. Students require specific features for their desks because their work focuses on their education and resources associated with it. They need ample storage and a clean design that matches well with their other furniture and décor. These desks come in several color choices to match the furniture you already have. They are also small enough to fit in dorm rooms or other small spaces. The desks on our list come with a variety of storage from closed drawers to open shelving. They have a wide surface to use as a workstation or put your computer on. We hope that this review has made your shopping process for the best desk for students easier. One of the desks on the list would make an excellent desk for you or the student in your life.